Virginia Water Radio: Episode 269 (6-8-15): What are the "Waters of the United States"? Episode 269 (6-8-15): What are the "Waters of the United States"? Transcript of audio, notes on the audio, photos, and additional information follow below. All Web addresses mentioned were functional as of 6-5-15. For an update on this topic, please see Episode 451, 12-17-18. From the Cumberland Gap to the Atlantic Ocean, this is Virginia Water Radio for the week of June 8, 2015. This week, we dive into tricky legal waters—that is, into the issue of what water resources are covered by the federal Clean Water Act. We start with an audio trip up a Montgomery County, Virginia, watershed from river to headwaters. Have a listen for about 20 seconds and see if you know what two key Clean Water Act terms govern what parts any other watershed fall under the Act’s jurisdiction. If you said, “navigable waters” or the “waters of the United States,” you’re right! The sounds were at the New River; along Toms Creek, a New River tributary; at a temporary pond near the creek; and at a seasonally wet channel that drains to the creek. All represent types of waters that either do, or may, fall under the Clean Water Act. First passed in 1972, the Act’s main goal is “to restore and maintain the chemical, physical, and biological integrity of the Nation’s waters.” The Act states that it applies to “navigable waters,” defined as “waters of the United States, including the territorial seas,” and Section 404 includes wetlands in the waters where fill activities are to be regulated. In 1986, the Army Corps of Engineers and the U.S. EPA published regulations that applied the Act to several kinds of non-navigable waters—including tributaries and adjacent wetlands—that may affect traditionally navigable waterways. That concept has been upheld by the U.S. Supreme Court. But many questions and legal challenges have been raised over implementation of the definition, and Supreme Court rulings in 2001 and 2006 generated even more questions and inconsistencies. Because wetlands have been and remain a focal point of that story, we close with part of “Baldcypress Swamp,” by Timothy Seaman of Williamsburg, honoring a type of forested wetland found along Virginia’s coastal streams and rivers. Music - ~ 15 sec - “Baldcypress Swamp,” by Timothy Seaman. 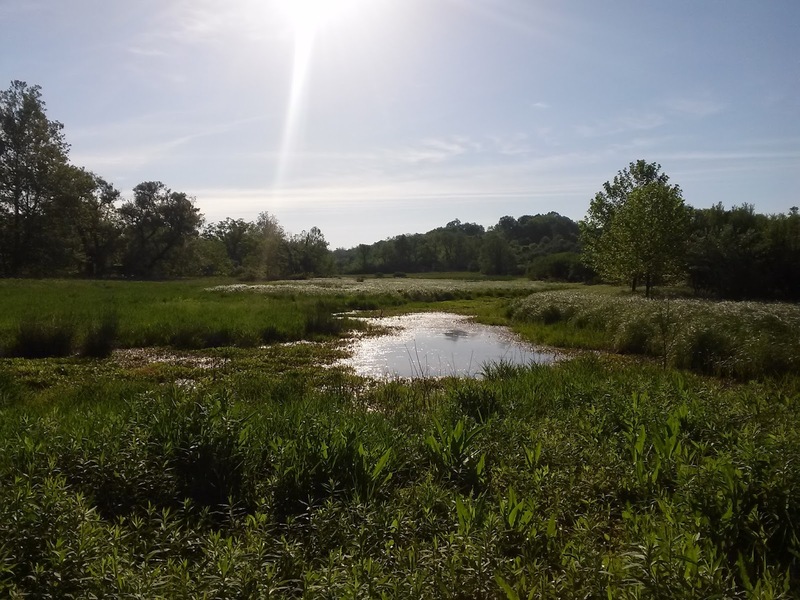 The sounds were as follows (all locations are in Montgomery County, Va.): New River at McCoy Falls, 4-4-12; Toms Creek confluence with New River at Whitethorn, 6-2-15; Toms Creek at Heritage Park in Blacksburg, 5-30-15; temporary pond near Toms Creek in Heritage Park in Blacksburg, 5-30-15, 9:30 p.m., with calls of American Toads, Gray Tree Frogs, and Green Frogs; and the sounds of birds and nearby bike-trail construction at a wetland that drains adjacent to a constructed farm pond, which drains into a small tributary that, in turn, drains into Toms Creek in Heritage Park in Blacksburg. Confluence of Toms Creek (at right) with the New River in Montgomery County, Va., June 2, 2015. Toms Creek in Heritage Park, Blacksburg, Va., June 2, 2015. Temporary (seasonal) pond near Toms Creek (marked by tree line at left), Heritage Park, Blacksburg, Va., May 20, 2015. Cattails and other wetland plants in seasonally-wet channel within Toms Creek watershed, Heritage Park, Blacksburg, Va., June 2, 2015. New York Times, Obama Announces New Rule Limiting Water Pollution, 5/27/15. PBS NewsHour, “Why farmers are concerned about EPA’s new rules on protected water,” 5/29/15, 7 min./4 sec. video, online at http://www.pbs.org/newshour/bb/farmers-concerned-epas-new-rules-protected-water/. U.S. Army Corps of Engineers/Regulatory Programs and Permits, online at http://www.usace.army.mil/Missions/CivilWorks/RegulatoryProgramandPermits.aspx. U.S. Army Corps of Engineers and U.S. Environmental Protection Agency (EPA), “Clean Water Rule: ‘Definition of the Waters of the United States,’” Executive Summary, accessed online at http://www2.epa.gov/sites/production/files/2015-06/documents/preamble_rule_web_version.pdf. U.S. EPA, “Clean Water Rule” Web site, http://www2.epa.gov/cleanwaterrule. U.S. EPA, “Documents Related to the Clean Water Rule,” online at http://www2.epa.gov/cleanwaterrule/documents-related-clean-water-rule. U.S. EPA, “Summary of the Clean Water Act,” online at http://www2.epa.gov/laws-regulations/summary-clean-water-act. Virginia Department of Conservation and Recreation/Natural Heritage Program, “Natural Communities of Virginia/Bald Cypress-Tupelo Swamps,” July 2013, online at http://www.dcr.virginia.gov/natural_heritage/natural_communities/ncPIa.shtml. Virginia Water Resources Research Center, Virginia Water Central News Grouper Web site, posts relevant to the Clean Water Act, online at https://vawatercentralnewsgrouper.wordpress.com/?s=Clean+Water+Act. See particularly “ClarifyingClean Water Act Jurisdiction and the “Waters of the United States” is Intent of "Clean Water Rule" Announced May 27, 2015, by U.S. EPA and Army Corps of Engineers,” 4/17/14, updated 6/23/15. Wetland Studies and Solutions (Gainesville, Va.,) “EPA & COE Redefine Which Wetlands and Streams are Federally Regulated,” Field Notes, Vol. 23/No. 4 (June 2, 2015), online at http://www.wetlandstudies.com/resources-regulations/fieldnotes-newsletter.html. For other episodes on water laws and regulations, please see the “Community/Organizations” category at the Index link above (http://www.virginiawaterradio.org/p/index.html).